We’re in Baden, Austria right now. This year they host three major events in row here: 1) the €5000 EPT Baden event, the €2000 Baden Open and the classic Seven Card Stud European Championship “PokerEM”, a €2,700 event which has been won by the likes as Phil Hellmuth before (lol). 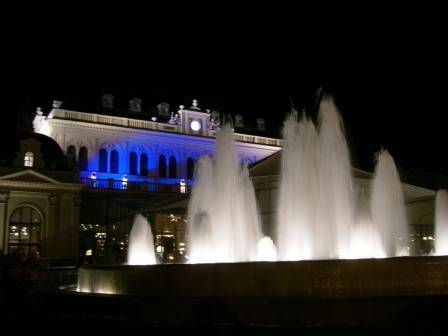 It is a great week here in one of the most beautyful casino locations available. I did not play the EPT but Katja did, she lasted like 8 levels in day 1 before busting out, never having any momentum. Right now the EPT is down to 12 players, the final is today. I love that two of my buddies, Marcus Golser and Duc Thang Nguyen are still in the tournament and I really wish them all the best for getting this one home. Both Katja and I played the Baden Open. Katja got busted by Paul Testud in his typical manner (playing agressivly and getting lucky) when she had 9-9 in a unraised pot (one limper and Paul in the SB just calling) and the flop came 6-7-8 rainbow. Paul checked, Katja went all-in right away with about 6,500 into a 1,500 pot, limper folded and Paul called (having lots of chips), showing 5-7. So far so good but the turn brought the 9 (!) making the straight for Paul and giving Katja a set. The river blanked out and Katja was gone. 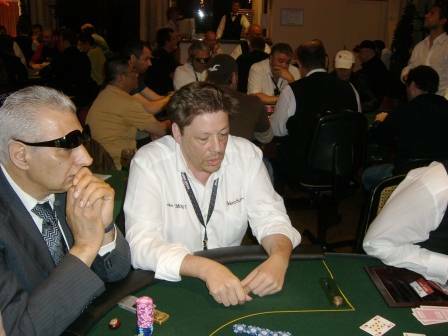 5 players limped with blinds at 100/200, including Marcel, Ross and me. Flop came down 2-4-6 with two clubs. The player who had the SB made a bet of like 2,500 into a 1,400 pot. I quickly folded my hand but Marcel called. All other players folded. The turn brought the 3 of clubs, completing a possible flush and a straight for everybody. Now the first player made a huge bet of like 8,000 and Marcel called again. River: A of clubs! Guy checked, Marcel went all-in and the guy called having less than Marcel. Marcel showed 10-5 offsuit, with the 5 of clubs for a mini-flush. Other guy showed 5-7 without any club and Marcel took a huge pot. Wow. Not only did Marcel limp in UTG+1 with T5o, he called a big bet with just a gutshot and a 5-high backdoor flush draw, he called for a large chunk of his chips on the turn against the nuts, gets lucky on the river and thinks his 5-high flush is good. Please note that I am not criticizing Marcel here, I am just looking at the hand if there is something to learn here. Quite honestly, I don’t think so. Anyway, I somehow got back to like 17,000 chips without any showdown, got moved, played the very first two hands on that table against the “Bully” with 140,000 chips there very aggressive and got to almost 30,000. Then I found Q-Q UTG, raised to 3,300 (BB 1000) and got reraised by the button to 9,000. I called to see a T-high flop but checked, having an odd feeling. He went all-in and I thought for like 3 minutes before laying it down (me! wow!). It was right on, he showed A-A. I got moved again with a stack of like 18k, average at 25k. My new table and seat (8) was bad news. Right behind me: Ross in seat 9 with 50k, Ram Vaswanni in seat 1 with like 80k, agressive famous asian guy with like 45k in 2 and Ivo Donev in seat 4. A few minutes later the guy with the huge stack of 140k came to this table also as did “Bad Girl” Xuyen Pham. Very though table and being the absolute short stack is not really helping here. Anyway, I played tight and made one more huge laydown (for me) when I called a raise from the UTG player with A-Q as did two more players (asian guy and Bad Girl). Flop came 9-J-Q with two clubs and the UTG guy made a good sized bet. I thought and with two players behind I folded to this very dangerous board, showing Ross my hand. Asian guy folded (later he said he had AQ also which I absolutly believe) but Bad Girl went all-in, meeting a call by the danish UTG player. Bad Girl showed K-J of clubs for pair, gutshot straight-draw and the second-nut flush draw. Danish guy showed 9-9 for a set. Turn came an A (now I would be hung) and river blanked out so Bad Girl lost a big pot. I made some money with Q-Q UTG and K-Q when I flopped K-K-8 and ended the day with average chips. Play will comence today. Btw, Barney Boatman wnet out with A-K vs. 10-10, Ram lost almost all of his chips vs. Mr. Big Stack when he semi-bluff check-raised on the flop of 3-7-T holding 8-9 for all of his chips and meeting a call with A-A. Ross lost one big pot somehow and finally lost 3-3 vs. T-T. My buddy Dirk Schümann then took out Ram with his last few chips (6-9 on the button, J-J for Dirk in the SB) and only one hand later he took Ivo Donev out by raising in the SB with Q-Q, Ivo thought two big pairs in a row are somewhat “unlikely” and went-all with 6-9, Dirk calling and winning). I dreamt last night I would get 3rd today – so now let’s see how dreams compare to reality!